Like I had mentioned in an earlier post, this Avarekalu season, I had bought a few pounds of it and had tried a couple of dishes with them. 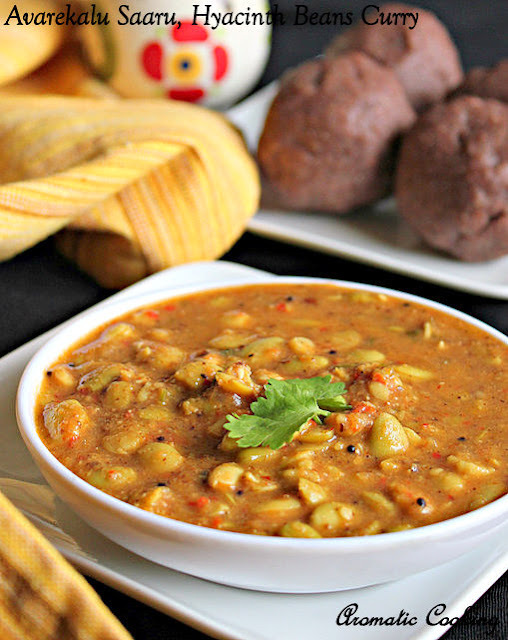 Today's dish is the most common dish that's made during the season, Avarekalu Saaru. It's a simple and delicious gravy and it goes very well with rice, rotis, idlis, dosas or if you like Ragi Mudde ( Ragi Balls, post coming soon ), then, this is the best combination with it. 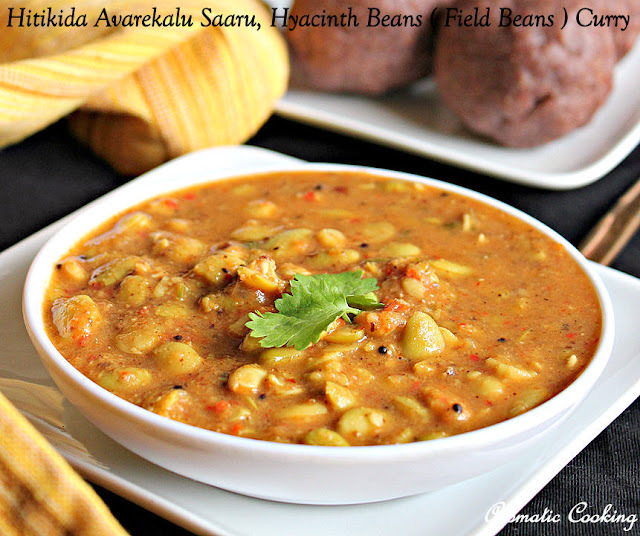 We use the beans after removing the skin, so it's known as Hitikida Avarekalu Saaru. Though the season is almost done for this year, if you are in the US, you can still make this dish with frozen surti papdi lilva, or even with dry beans.. 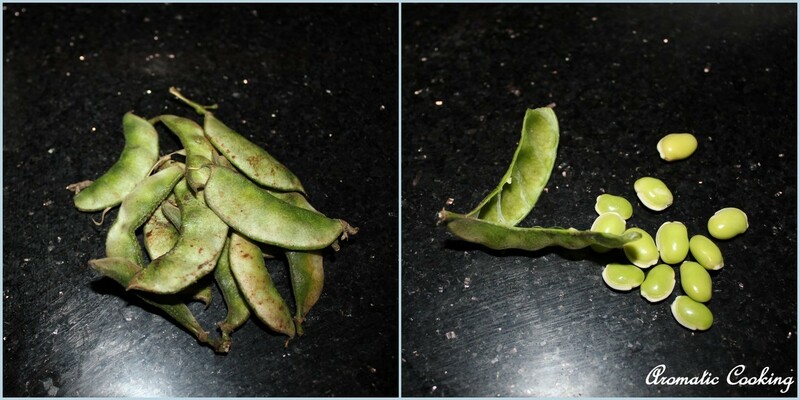 I have once again shown how to remove the pods from the avarekalu. Then you soak them in water for 2 to 4 hours and push out the pods from the outer skin using your fingers, this is hitikida avarekalu. 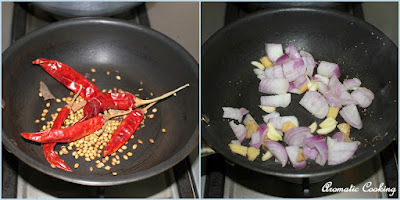 Heat some oil in pressure pan, add the mustard seeds, when it starts sputtering, add the chopped onion, saute till it turns translucent, then add the curry leaves followed by the tomatoes and turmeric powder and saute it for a minute. Add the 2 cups avarekalu, salt and a cup of water, cover and cook it for one whistle. In the meantime, roast the red chillies, coriander seeds, cumin seeds, cloves and cinnamon ( given under 'to grind' ) in very little oil, finally add the poppy seeds, roast and remove. Heat a little oil, add the onion, garlic and ginger and saute till lightly browned. 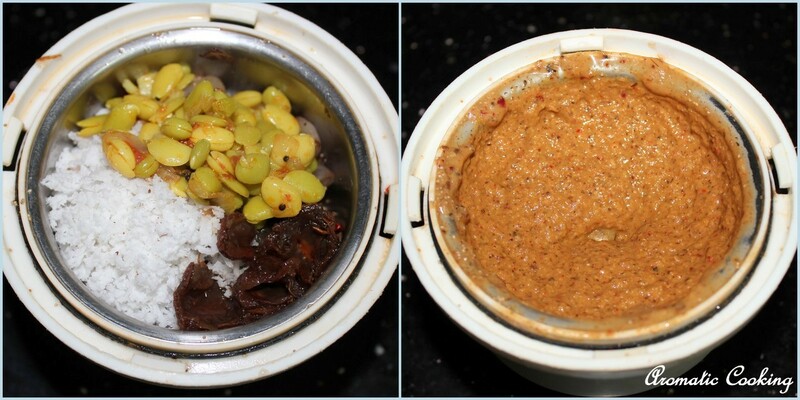 Cool it a little and grind it with the roasted spices, tamarind ( saok it in a little hot water to soften it ), coconut and about 11/2 tablespoons of the cooked avarekalu into a smooth paste. Add this paste to the cooked avarekalu along with a little water, bring it to a boil and then simmer it for for 5 to 7 minutes. Add the chopped coriander and switch off. Make the gravy thick or thin according to your desired consistency. If you can get byadgi chillies, then use it in the place of the red chillies, but use a little more, it's usually less spicy and gives a beautiful color to the gravy. 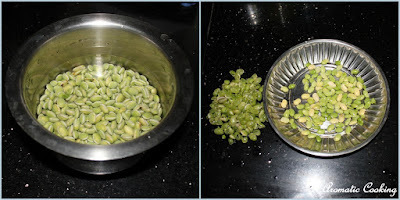 If using dry beans, soak and cook them, then use it to make the gravy. 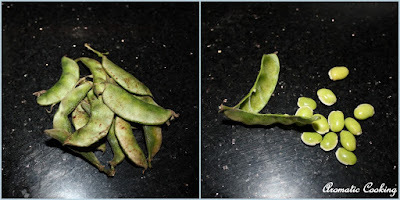 Is it broad beans, love this curry.